How Safe are British Roads? The UK is one of the safest countries in the world, according to Wikipedia, in fact the UK is the 5th safest (after The Marshall Islands, Sweden, San Merino and Malta) with only 3.59 people killed per 100,000 .The French kill 7 people and the Americans 12.3. The most dangerous country with 48.5 dead per 100,000 is Eritrea. We could do even better. Here is an example of a crash easily avoided (admittedly it wasn’t fatal). 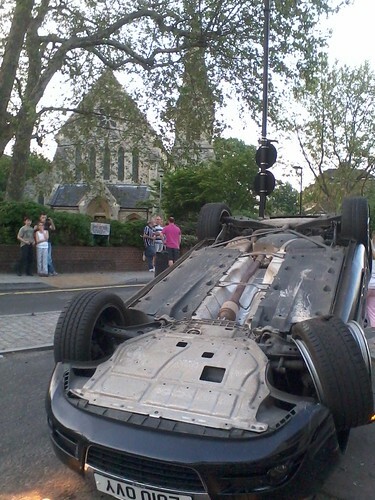 This car turned upside down by traffic calming bell in Islington, London. A measure put in to calm traffic which makes it harder to drive, slower and could even damage our vehicle (if we try this after a pint). 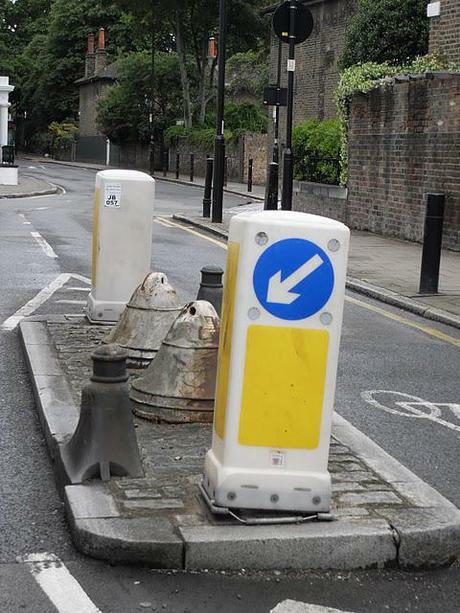 Why should we be forced to slow down in our cars to squeeze past one of these? Look at the picture of a bicycle in the middle of the road. All the driver did was to try and overtake a slow bicyclist who was riding in the middle of his lane, taking the p*ss. His car was wrecked and he was bruised because of the cyclist. Drivers shouldn’t have to slow down because some people can’t afford a car and choose to cycle. If we get rid of all road calming measures and there’d be fewer crashes like this one. That would be safer for all of us! That’s just poor driving regardless of what theory you come up with. Is this some sort of parody website? Roads are only as safe as the nut behind the wheel.If you don’t drive to the conditions “accidents”occur.You should be studying driver’s moronic,selfish and intimidating behaviour before making the excuse of either road layout or driving conditions.My experience is approximately 1500 miles per week in all conditions,so probably more than whoever commisioned this whitewash of driver manners. It is interesting, while a lot of effort is being put in to making our roads safer, care of the roads is getting worse. Undoubtly the roads are safer in Britain than many other countries, however collisions will happen, for whatever reason. Obvious concerns such as speed and distractions are a major contributor to collisions. It would seem that the roads them selves are contributing to safety issues. Major pot holes are opening up, weeds and even trees are growing in the central reservations weakening road barriers, road surfaces are in poor condition in part due to poor repairs. The Highways Agency repairs are slow to carry out repairs, and county council subcontractors not doing work properly. Driver error dues to many factors including driving when drunk, or tired of course play a big part, however if the roads are not up to a safe standard this increases the changes of an accident and or increases possibilites of an accident or collision becoming larger in impact due to roads being an unsafe condition. Other issues I have come across include poor lit streets and junctions, and more common than I would like to think possible are poorly maintained cars. Not only basic care such as tyres and tyre presuures, but light bulbs, brakes, etc. Again poorly maintained cars or vehicles will be increase the impact of a collisions, this includes stopping distances. We the driving puiblic need to make choices as to what we want, and that includes checking our own vehicles, and carrying out the needed repairs ( or getting some one to do it ). Being prepeared to slow down, and take time to drive. If we see a poorly maintained car or road report it, it could be a killer ! I used to be a HGV class 1 Lorry Driver with an impeccable safety record following an accident at work in 2007 I was on a course of pain killers which affected my driving I explained this to my employers, following another visit to my Doctor, the Doctor agreed with me and she wrote a sick certificate for a month as she stated ” I was to poorly to drive” the company promptly sacked me & I’ve not worked since, the whole situation has caused a condition known as Post anxiety distress, because I was sacked from a job, my only concerns were for other road users and the general public which was explained at lenght, but my employers were aderment that their decission was right even though they knew the reasons where for others saftey and I was sacked. now you know why so many HGV drivers to continue to drive even though their unfit due to medication which they dont declare for fear of Loosing their jobs while unfit to drive. Another program based on safety which just seems to poorly mask an ongoing campaign to monitor us more and more and take away more pleasure from our lives. I choose to drive because I enjoy driving. If Bradley Wiggins had been in front, the car would not have needed to overtake, and this would never have happened. Like all cyclists, Bradley hasn’t got any common sense on the road though. When it comes to keeping himself safe, he should have realised that the van driver was not looking for cyclists coming along on the type of road he crashed on. Had he slowed down on approach to the garage he could have stopped if the van pulled out, and then he would not have injured himself. Sean… like *some* cyclists – not all. What a sweeping generalisation. You think cyclists are all the same? Wrong. I’m a cyclist and am always aware of my surroundings on the road. I stop at red lights (unlike some), use a mirror, use lights and give way when I should. Don’t tar us all with the same brush. As for the van driver, he should be expecting anything if he is on the road. Accidents are essentially unexpected so he should be ready. Cyclists have as much a right to safety as anyone. It seems in this case that the driver is at fault for recklessness.